Notes: In 1899, Sorolla painted Sad inheritance! (Bancaja Collection), which led to his international consecration when it won a prize at the Universal Exhibition of Paris one year later. Here, social drama, conceived in the open air at the Cabanal’s seaside of Valencia, naturally integrates light and landscape. 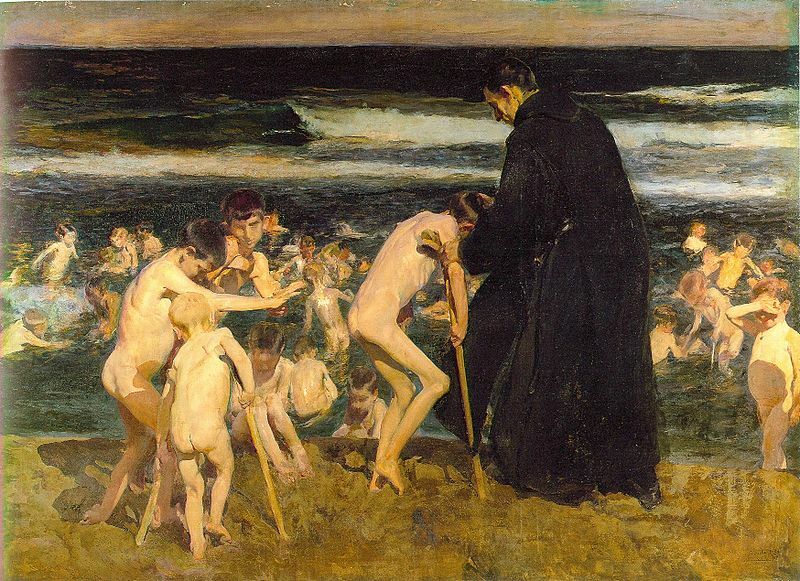 Among the group of blind, crazy, crippled, and leprous children, he shows us, with striking realism, the naked body of the child struck polio in the center of the picture, who, with great difficulty, is trying to bathe at the beach with the help of a monk of the Orden Hospitalaria de San Juan de Dios.